London Underground has more than 426 escalators that all needing maintenance on a regular basis. 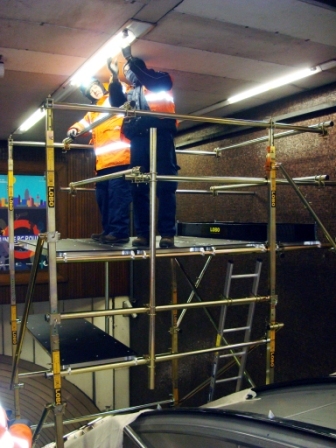 Many of these maintenance tasks are performed above and below escalators and in other awkward to access areas within the stations and tunnels. annually. However, routine maintenance and improvement work on all assets must be performed during the night. The station needs to be closed, power needs to be switched off, and escalators powered down & locked before any cleaning or repair work can be performed. To simply replace a light fitting can cost thousands of pounds as scaffolding has to be erected, the task performed, and the scaffolding dismantled all in the space of 4 hours. The cost to achieve this, at night and within the 4 hour time frame is high and LU needed to find an alternative solution to reduce the cost of the scaffolding and provided a safe method of work for their maintenance teams. As much as £10,000 can be required to set up the scaffolding system for one night’s work. By using the LOBO System you can get you money back in one night! The LOBO System is a versatile work platform scaffolding product that combines the flexibility and strength of traditional scaffolding with the simplicity and mobility of tower systems. No tools are required. This combination provides the ultimate access system that is utilized in maintenance applications. 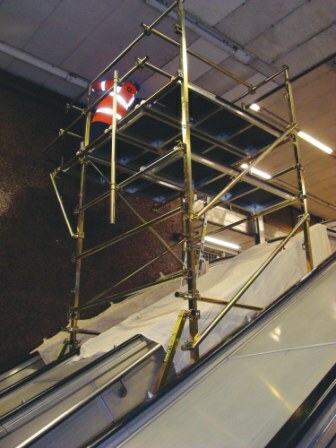 The system is particularly useful when access over stairs and escalators is needed for maintenance tasks above these obstacles as a cantilever can be configured. The LOBO System comprises of steel trestle legs, extensions and tubes that vary in size to enable a structure to be assembled into any shape or size, perfect for awkward areas where access is restricted. The LOBO System can be assembled quickly, easily and safely around, under or above stairs, escalators and machinery – by your own in-house maintenance crew. This means out-sourced scaffolding labour costs can be reduced without comprising safety. Areas, previously considered difficult to get to, can now be accessed with ease for maintenance and cleaning purposes. In addition, it is available 24/7 and so puts you in control of what and when you schedule your maintenance tasks. a) The LOBO System is scalable, adaptable and adjustable to meet your ongoing and changing requirements. Simply add more components or alter your existing configuration to satisfy the demands of the next task. Protect your initial investment with a product that will meet all your access needs safely. b) The LOBO System is a rigid and stable product, which meets or exceeds current safety regulations. Handrails can be fitted in seconds, at any point inthe erection process. Experience shows that deploying the LOBO System reduces the costs associated with the labour costs of hiring and constructing traditional scaffolding. By reducing reliance on out-sourced scaffolding, cost savings will be achieved – usually well within a 12-month period. Available 24/7, quick to erect – and above all safe – it is immediately adjustable for your next task with no staff waiting time while new fixed-frame structures are built. Re-configurable, again and again, this product comes with no disposal costs and minimal replacement and competitive on-going training costs. NASA, General Motors, Babcock, General Electric, Nestle, Lockheed Martin, JLR, Unilever, Airbus. Canada: S269.2 Access for construction purposes.